During Apple’s iPad 2 event on Wednesday, the company also announced and showed off the upcoming GarageBand for iPad app, a version of Apple’s music creation software that’s part of iLife. Like its OS X cousin, GarageBand for iPad allows users to play and record multiple instruments either by connecting them to the iPad, or through the use of a number of touch instruments, including keyboards and drums. The app includes numerous sampled instruments, a drum machine and more than 250 music loops. GarageBand also support multi-track recording and allows users to mix up to eight different tracks. Apple has also added mock-pressure support into the app using the iPad's accelerometers. GarageBand uses these sensors to determine the amount of force with which each finger taps, much like a piano’s mechanical keyboard does in real life, producing softer or louder sounds in response. The guitar simulator also supports a palm-muting technique of sorts to produce a dampened sound by holding a finger steady over the instrument’s strings. Even users unfamiliar with the art of making music have something to look forward to. 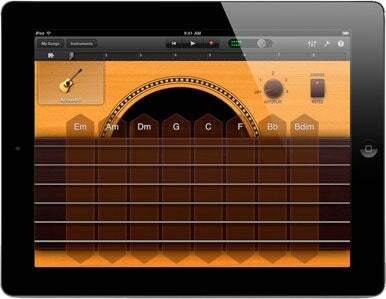 GarageBand supports smart instruments, which make it possible to play chords at the touch of a button. And that’s not all: once your masterpiece is complete, you can share it with friends via e-mail, send it to your iTunes library for your personal enjoyment, or even continue working on it in GarageBand on the Mac. GarageBand will be available through the App Store on March 11 for $5; the app is compatible with either the original iPad or iPad 2. Updated at 5:40 p.m. PT to add information about compatibility and the accelerometer support.